Home / Blog / New Feature / 16 for 2016! It’s been a great year here at Measured Search. 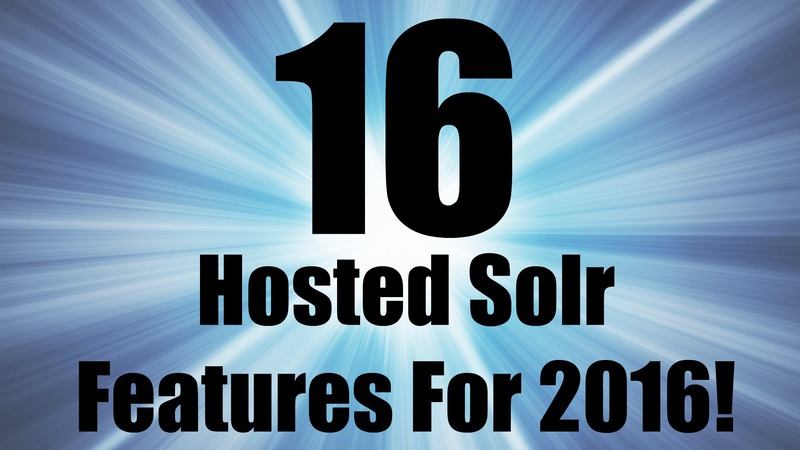 We wanted to give you a quick update on all of the great things we’ve released this year for SearchStax by Measured Search – the only Fully Managed Solr-as-a-Service cloud-agnostic solution. We’ve got a lot of great things planned for 2017 and we’re looking forward to sharing more with you in the coming months! Wishing you all a wonderful and memorable holiday season. SearchStax now offers an integration with Rosette for Solr by Basis Technology. This integrated solution enables entity extraction and linking to facilitate high quality faceted search by extracting people, locations, organizations, products, and many more entity types. The entity extraction utilizes a combination of statistical models, gazetteers and regular expressions and can link those entities to Wikipedia or a custom entity database. Enhanced name search is also enabled – overcome misspellings, nicknames, missing spaces, the same name written in different languages, or other variations. Contact us to learn more. SearchStax® Analytics provide the insights you need to make your search experience better for your customers. New streaming API, and much more. SearchStax now with New Relic! Get full integration with PagerDuty, the real-time incident resolution solution for the modern IT Operations team. With a SearchStax and PagerDuty integration, Ops teams can minimize business-disrupting events and meet the availability and performance demands of the digital enterprise. Contact us to learn more. Audit logging helps you answer the question “who did what, where, and when?” within your SearchStax platform. We love cloud automation and strive to figure out ways to speed our customers’ development and release cycles. We have now enabled the ability to deploy custom JARs through SearchStax Cloud Manager. SearchStax Gold and above customers no longer have to go through our support team to deploy their custom JAR’s. The SearchStax Dashboard is enabled to completely control which JARs are to be deployed. To learn more, click here. As part of our support services at Measured Search®, we offer our premium customers service-level guarantees (SLA) around response time and availability. Our goal is to empower developers and companies around the world to build powerful and innovative applications utilizing open source software. Our robust and scalable infrastructure makes it easy to deploy, manage, scale and optimize Solr on the cloud. Mumbai, India and Sydney, Australia join Oregon, N. Virginia, N. California, Dublin, Frankfurt, and Singapore regions already available to developers to spin up Solr clusters. To learn more, click here. Both types of alerts create an “incident” report that you can inspect in the SearchStax dashboard. Contact us to learn more. SearchStax now sends email alerts whenever your disk space reaches less than 20% of it’s capacity. It allows both our customers and our support team to take action to prevent an out of disk error and to avoid downtime. Contact us to learn more. Bring in other people on your team to perform various functions. Assign who can view reports vs. who can create & delete deployments. Contact us to learn more.